Martha McDaniel was born in 1829 at Edgefield, Edgefield, South Carolina, USA. She married John W. Glanton on 12 December 1850. Martha McDaniel six children: Charles F., Anna L., Edward, William T., Martha and John. Her married name was Glanton. Obituary of "Departed this life in Edgefield District - in the neighborhood of Red Oak Grove Baptist Church - on Wednesday morning, March 9, 1859, in the 26th year of his age. He came to death by a pistol ball fired from the hands of James H. Jones, a native of North Carolina. He has left a wife and four children. Little Mary was already sleeping under the clouds of the valley." [S36] Peggy McDaniel, "Family Group Sheets prepared by Peggy McDaniel Casella, 1987", Ancestral File. [S588] 12 Dec 1850 Federal Census, unknown repository address. Ellen McDaniel was born in 1833 at Edgefield, Edgefield, South Carolina, USA. She married David A M Blalock on 1 January 1852. Ellen McDaniel was also known as Ellender McDaniel. She appeared on the census of 12 December 1850 in the household of Frederick McDaniel and Emily 'Millie' Holmes at Edgefield District, Edgefield, South Carolina, USA.1 Her married name was Blalock. [S759] 13 Sep 1860 Federal Census, unknown repository address. [S761] 12 Jul 1870 Federal Census, unknown repository address. [S760] Jun 1900 Federal Census, unknown repository address. Sarah Ann McDaniel was born in 1837 at Edgefield, Edgefield, South Carolina, USA. She appeared on the census of 12 December 1850 in the household of Frederick McDaniel and Emily 'Millie' Holmes at Edgefield District, Edgefield, South Carolina, USA.1 Sarah Ann McDaniel 1860 Census lists her age 22 living at home in 1860. She appeared on the census of 13 September 1860 in the household of Frederick McDaniel and Emily 'Millie' Holmes at Edgefield, Edgefield, South Carolina, USA. She was called Ann and her age was shown as 22.2 Sarah Ann McDaniel 1870 Census not living at home. in 1870. Jasper McDaniel was born in 1842 at Edgefield, Edgefield, South Carolina, USA. Matilda McDaniel was born on 28 September 1847 at Edgefield, Edgefield, South Carolina, USA. She married George Vance on 15 November 1866. Matilda McDaniel died on 22 May 1902 at age 54. Catherine McDaniel was born in 1850 at Edgefield, Edgefield, South Carolina, USA. She married Bartley Bussey on 15 November 1866. John W. Glanton married Martha McDaniel, daughter of Frederick McDaniel and Emily 'Millie' Holmes, on 12 December 1850. David A M Blalock married Ellen McDaniel, daughter of Frederick McDaniel and Emily 'Millie' Holmes, on 1 January 1852. David A M Blalock of Alabama. George Vance married Matilda McDaniel, daughter of Frederick McDaniel and Emily 'Millie' Holmes, on 15 November 1866. George Vance died on 19 October 1926. Bartley Bussey married Catherine McDaniel, daughter of Frederick McDaniel and Emily 'Millie' Holmes, on 15 November 1866. As of 1810, Levi McDaniel Sr. was also known as Levy McDaniel from 1810 US Census. He There was no Levi McDaniel found in the 1830 US Census indexes for Edgefield, SC. There was a Levi McDaniel in Lancaster SC, over 70 miles northeast of Edgefield but that Levi did not own any slaves whereas the Levi McDaniel in Edgefield did. It seems unlikely that this Levi would pick up and move and then move back when he owned a farm and slaves. He did join the church in 1928 in Parksville, McCormack County, SC which shares a long border with Edgefield so it is likely he remained in the Edgefield area in 1830. in 1830. He As documented in" History of Edgefield Co from the Earliest Settlement to 1897," Levi was a founder of the Red Hill Church where he was buried. "[Red Hill] church was constituted June 20th. 1835, by Elder Samuel Cartledge and William Watkins, with the following members: William Watkins, pastor; Reuben Johnson and Erasmus McDaniel, deacons; Levi McDaniel, clerk; members. Martin Rose, Sr. , Frederick McDaniel, Wm. Roberts, Sr. Thos. Ford, Calvin Cox, Eady Rose, Judy Johnson, Henry Baugh, Anna McDaniel, Emilia McDaniel, Obedience McCary, Sealy Shinall, Caroline McDaniel, Elizabeth Holmes, Clarracy Roberts, Martha Cox, Orpha Forde, Lydia Parkman, Lucy Holmes, Elizabeth Collins, Patience Blalock—ten males, fourteen females. Not one of these is living at this date, September 5th, 1893." in 1849 at Red Hill Baptist Church, Edgefield, South Carolina, USA. [S754] Find-a-Grave, online http://www.findagrave.com, Find A Grave Memorial# 72266227. [S589] 12 Dec 1850 Federal Census, unknown repository address. Alicia Ann Holmes was born on 19 December 1785 at Edgefield, South Carolina, USA. She married Levi McDaniel Sr. on 30 January 1799. Alicia Ann Holmes died on 14 September 1864 at Edgefield, Edgefield, South Carolina, USA, at age 78. Alicia Ann Holmes was also known as Anna Holmes.2 Her married name was McDaniel. Alicia Ann Holmes and Levi McDaniel Sr. appeared on the census of 12 December 1850 at Edgefield District, Edgefield, South Carolina, USA.3 Alicia Ann Holmes Name Ann from will of Levi LDS film 23869 Will Book E pg 253/254 1850 census list age 66 b. SC after 14 September 1858. Line Number 7 on 8 June 1880 at Farmer, Moss, Edgefield, South Carolina, USA. Francis Alice Duke was also known as Alice Frances Dukes. 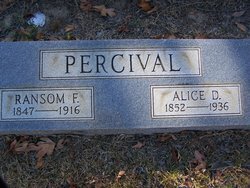 As of 1869,her married name was Percival. Erasmus McDaniel was born on 18 November 1809 at Edgefield, South Carolina, USA. He married Caroline Holmes, daughter of Jonas Holmes and Elizabeth Howle, on 19 April 1832. Erasmus McDaniel died on 10 May 1863 at age 53. [S905] Erasums McDanile v. Frederick McDaniel, unknown record info, published in Edgefield (SC) Advertiser, unknown repository. NOTICE is hereby given, that by virture of an order from Chancellor Johnston, I shall offer for sale to the highest biddere, at Edgefield Court House, on the first Monday in November next, the real estate of Elizabeth Holmes, deceased, consisting of a tract of land situate in Edgefield District, on Stevens' Creek, a branch of Savannah River, containing seven hundred and thirteen and a half acres, (713 1/2) more of less, and adhoining lands of the said Erasums McDaniel, Charles Parkman, Frederick McDaniel, Thomas Howle, Delila Cartledge and the estate of Charles Blalock, on a credit of one and two years, except so much as may be necessary, to pay the costs, which must be pain in cash; the purchaser to give bond and personal security, and a mortgage of the premises. [S762] 11 Dec 1850 Federal Census, unknown repository address. Alvin McDaniel was born on 6 June 1817 at Edgefield, South Carolina, USA. He died after 1858. [S492] Dennis Quarles, "Quarles, Dennis Email 24 Jul 2001," e-mail to Walter Wood, 24 Jul 2001. William Levi McDaniel was born on 30 March 1829 at Edgefield, South Carolina, USA. He married Elizabeth Linda Parkman on 13 January 1852.1 William Levi McDaniel died after 1880. [S683] Ancestry.com Janice Holmes Seigler Tree, online ancestry.com. [S684] William Levi McDaniel, Death Certificate- MCDANIEL, Wm Levi 1858-1943. Harriet McDaniel was born on 4 February 1822 at Edgefield, South Carolina, USA. She died before 1847. James Jesse Clifton was born in 1795 at South Carolina, USA. He married Mary Spears. James Jesse Clifton died in 1845 at Crocketville, Hampton, South Carolina, USA.